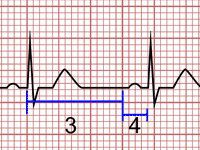 The calculation of the Heart Rate (HR) is the first step to interpreting an Electrocardiogram. In regular rhythm, we can calculate the Heart Rate counting the number of large and small squares between two QRS complexes. The value of the Heart Rate is equal to 300 divided by the number of large squares + remaining small squares multiplied by 0.2. To calculate the Heart Rate with this HR Calculator enter the number of large and small squares between two QRS complexes. Remember: This Hear Rate Calculator is only valid for Electrocardiograms with Regular Rhythm. Bradycardia: Heart Rate less than 60 bpm. Normal: Heart Rate between 60 bpm y 100 bpm. Tachycardia: Heart Rate over 100 bpm. You should count the number of large squares (5 mm) between two QRS complexes (RR Interval), and afterwards you should count the number of remaining small squares (1 mm). Enter the values into the Heart Rate calculator and then click Calculate. Example: Enter 3 large squares and 4 small squares into HR calculator.